Ingenious heating elements in the base of the windshield help defrost frozen wiper blades quickly, and easily so you don’t have to hack and scrape ice away before driving. Another feature that will make life easier year-round is the available proximity-activated Smart Power liftgate. If you are carrying the proximity key, there’s no need for any extra movement or action. 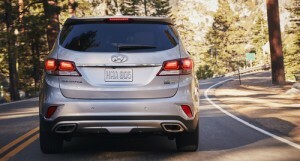 Just walk up to the rear liftgate, and it will open automatically, so you can unload an armload of cargo, effortlessly. Available HID headlights offer crisp, white illumination of the road ahead, improving visibility and reducing driver strain on longer trips. This advanced lighting technology also features an Adaptive Cornering System, which enables the headlights to turn with the direction of the steering wheel to light not only where you are, but where you are going. Adapting to the cold comes much easier with standard driver and front passenger heated seats, and passengers can enjoy the feature as well as available second-row heated seats. During warmer months, the 2018 Santa Fe XL also offers available ventilated front seats for added comfort. An available 8.0” touch-screen navigation system not only helps guide you from point A to point B but can also be used to search for gas stations, ATMs or restaurants. 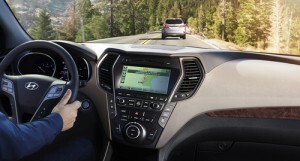 It also provides an intuitive interface for you to stream music from your smartphone, access either Android Auto or Apple CarPlay connectivity or talk to family and friends with the Bluetooth hands-free phone system. An available panoramic power sunroof spans over both the front and rear passengers for a feeling of exceptional openness and luxury. Parents love Santa Fe XL’s YES Essential cloth seating that provides soil-resistant, anti-odour and anti-static properties for added comfort and longevity. Moms and Dads also love being able to switch effortlessly between two separate driver profiles at the touch of a button with the available Integrated Memory System. 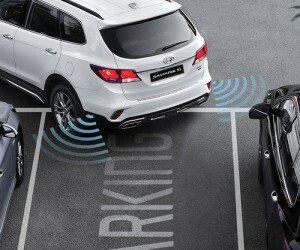 It automatically resets the driver’s preferred seating position and corresponding side mirror adjustments. 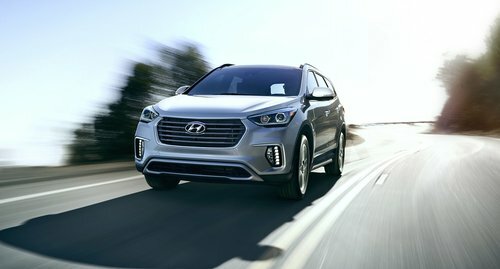 Adding Santa Fe’s handsome good looks and cutting-edge safety systems and driver assist technologies such as all-wheel drive, available Multi-view cameras, Blind Spot Detection with Lange Change Assist, Rear Parking Assistance, Autonomous Emergency Braking, Lane Departure Warning, Rear Cross-Traffic Alert and Hillstart Assist Control and Downhill Brake Control and it’s easy to see why Santa Fe XL is so popular. The 2018 Hyundai Santa Fe XL pricing starts at only $32,199 and represents a terrific value in its category. When adding in Santa Fe XL’s impressive fuel economy ratings of 12.9/9.4/11.3L (city/highway/combined) per 100km, few other vehicles in this class represent such a great value. Arrange a test drive today and consider how many ways the 2018 Santa Fe XL could make your life easier.